A painting of Cardinal Joseph E. Ritter of St. Louis. Pope Francis announced on Oct. 9 the 17 newest members of the College of Cardinals, including Cardinal-designate Joseph W. Tobin, archbishop of Indianapolis. Although this historic selection makes him the first cardinal to lead the Archdiocese of Indianapolis, he is not the first cardinal with ties here. 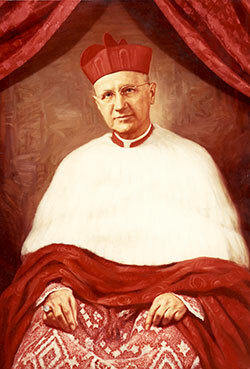 Cardinal Joseph E. Ritter served as bishop of the then-Diocese of Indianapolis beginning in 1934. He became the first archbishop of Indianapolis in 1944 when the diocese became an archdiocese. In 1946, Cardinal Ritter was named archbishop of St. Louis, and was appointed a cardinal in 1961. Cardinal-elect Tobin and the others chosen for this office will be inducted into the college on Nov. 19 at the Vatican. Their responsibility as close advisers to the pope and as electors of a new pope is rooted in the traditions of the ancient Church. However, the college has been flexible enough through the ages to serve the needs of the bishop of Rome and the faithful around the world in ways that are needed in a particular time. The college originated in a group of local clergy who collaborated with the bishop of Rome. The term “cardinal” began to be used in late antiquity, and is derived from the Latin word for “hinge.” It refers to the fact that particular clergy in Rome were linked to specific churches there, a practice that continues today as all cardinals are honorary pastors of churches there. In many instances in the ancient Church, local clergy, including those in Rome, elected a new shepherd when its previous one died or stepped down from office. This is, in part, the root of the current practice of cardinals under the age of 80 serving as electors of a new pope. As the Church continued to expand in Europe in the later period of the western Roman Empire through the early Middle Ages, the role of the bishop of Rome in the pastoral leadership of the universal Church became more defined. Beginning in the late 11th and early 12th centuries, the College of Cardinals as close advisers of the pope were chosen from beyond the Church in Rome to include bishops elsewhere. Their role in electing a new pope also became more defined during this time. This was in part due to disputes over who should be elected that involved the interference of secular governments. To limit outside influence in papal elections and to move the cardinals forward in electing a new bishop of Rome, the “conclave” was developed. Rooted in a Latin phrase which means “with a key,” a conclave put the cardinals alone together in a locked place. An early practice stipulated that if the cardinals could not agree on a candidate, then their ration of food would be decreased. For more than 200 years, the cardinals have gathered in the Sistine Chapel, surrounded by the art of Michelangelo to elect a new pope. The last conclave to take place outside the Sistine Chapel occurred in 1800 at San Giorgio Maggiore Monastery in Venice after Napoleon and his French forces had conquered Rome in 1797. They took the previous pope, Pius VI, back to France. He died in 1799 while imprisoned there. The color red is traditionally connected to the office of cardinal because it symbolizes the willingness of these close collaborators with the pope to defend him and the Church to the point of shedding their blood. When those selected for the college are inducted into it, they traditionally receive a red hat, known as a biretta, from the pope as well as a ring symbolizing their close relationship to the Church. They also wear red cassocks or black cassocks with red piping as a sign of their office. The bishops of Rome alone choose who are to serve as cardinals, who then often serve as close advisers to them in addition to being those who will elect their successors. Blessed Paul VI made changes in the mid-1970s to the process of electing a pope, decreeing that only cardinals under the age of 80 can serve as an elector in a conclave and setting the maximum number of electors at 120. Those 80 or older may participate in discussions leading up to a conclave, but are not included among the electors. It has been a fairly old custom of popes to select clerics 80 or older as cardinals to honor their service to the Church. Blessed John Henry Newman became a cardinal in this manner in 1879. Three of the 17 new cardinals are above the age of 80. In the past, cardinals were primarily chosen from European countries and, later, the United States. That slowly began to change in the 20th century when a handful of cardinals were selected from some South American countries. Blessed Paul expanded this trend, naming cardinals from around the world. St. John Paul II, Pope Emeritus Benedict XVI and Pope Francis have continued this practice to such an extent that 79 countries are now represented in the college. They retain a tie to the ancient practice of cardinals being among the clergy of the Church in Rome by being assigned as honorary pastor of a church in the city. Some cardinals serve the Church at the Vatican, while many more lead particular Churches around the world. These latter, however, are typically selected to advise the various offices of the Vatican and sometimes serve as the pope’s representative at Church celebrations around the world.